Students will participate in informative classroom-style presentations as well as practical demonstrations with a variety of Police Department personnel. Activities include a police facility tour, a jail tour, real world exercises, fingerprinting and crime scene investigation, and other demonstrations. Instructors are drawn from all areas in the Department. Students meet the Chief of Police, Captains, managers, supervisors, patrol officers, detectives, dispatchers, and other department employees. We encourage students to ask questions and express their concerns about pertinent issues. A major goal of the Citizens' Academy is to increase understanding between our community and the Police Department and to enhance the strong relationships we have with the community. While the Academy will give students a better understanding of how the Police Department is organized, the services we provide, and how we serve the community, it is not based on a traditional police academy. The program is not designed to prepare students to be police officers or provide training in the field of law enforcement. A typical Citizens' Academy class is made up of 20-25 students of all age groups, and instructors will accommodate any physical limitations. The Montebello Police Department is happy to announce a new program called the “Safe Exchange Zone”. Safe Exchange Zones are designed to increase safety for individuals buying and selling goods through websites such as Craigslist, Offer Up and Facebook's Marketplace. There will be designated parking stalls at the Montebello Police Department for individuals to complete these types of transactions, without the fear of being robbed for their property or money or the fear of violence. The City of Montebello and other cities have experienced numerous violent crimes during private party exchanges. These exchanges began as private party transactions where citizens have agreed to meet in a retail center parking lot or at a private residence. These cases involved the seller intentionally luring the buyer or seller to these locations with the intent to rob them. 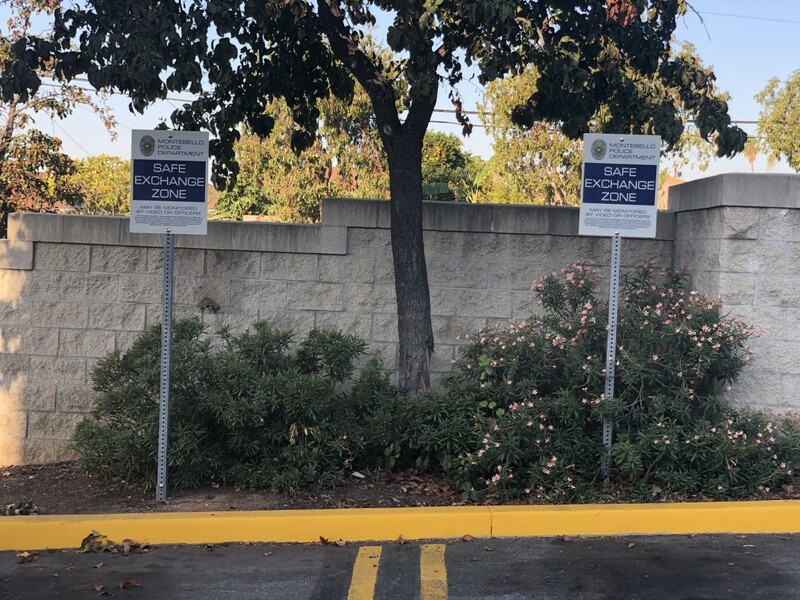 Beginning today, the Montebello Police Department will designate two parking stalls in the public parking lot of the Police Department located at 1600 West Beverly Boulevard. The parking stalls will be well lit at night and marked with signage that indicates the stalls are for the purpose of Safe Exchange. The parking stalls may be monitored by surveillance cameras and/or officers at all times. The Montebello Police Department encourages anyone meeting a buyer or seller to take advantage of the Safe Exchange Zone at Montebello PD as a safe alternative to conduct private party transactions. Traffic Officer Estupinian conducting enforcement of a truck off the designated route. The Police Department has recently received several complaints of large, commercial vehicles driving off the truck route and onto residential streets. The city has designated certain roads to be suitable for commercial traffic per California Vehicle Code 21101. The routes are designed to keep heavy vehicles off residential streets as well as steep grades where braking could be a concern. Large trucks traveling off these routes can cause traffic hazards and damage streets not designed for the excessive weight. The routes are marked by traffic signs, several of which have recently been added or replaced for better visibility. On August 29th, the Montebello Traffic Bureau responded to the communities concerns and conducted focused enforcement on commercial vehicles throughout the city. 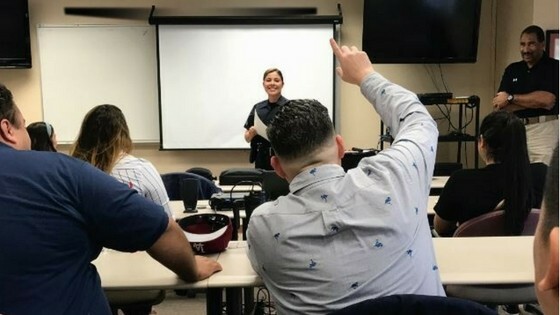 Montebello Police Officers were assisted by two sergeants and four officers from the California Highway Patrol who specialize in commercial traffic law enforcement. These additional resources helped make a large impact on the day’s operation and helped educate drivers on the rules of the road. Officers conducted numerous traffic stops related to enforcing our large vehicle and commercial trucking laws. These traffic stops resulted in over 50 citations being issued. The Traffic Bureau will continue to make commercial trucking law enforcement a priority to improve on today’s progress. The Montebello Police Department is grateful to the CHP for their assistance in making today’s operation a success. Montebello, CA—In the United States, the Cinco de Mayo holiday is often associated with parties and alcohol. If you’re celebrating with friends and family this weekend, remember that at the end of the night, you need to have a safe and sober ride home. Police, Sheriff and the CHP will be out in force looking for the tail-tell sign of impaired driving this weekend. The Montebello Police Department will deploy additional officers on special DUI Saturation Patrols specifically to stop and arrest drivers showing signs of alcohol or drug impairment during the hours of 8:00 PM and 3:00 AM in areas with a history of DUI crashes and DUI arrests. In recent years, California has seen an increase in drug-impaired driving crashes. 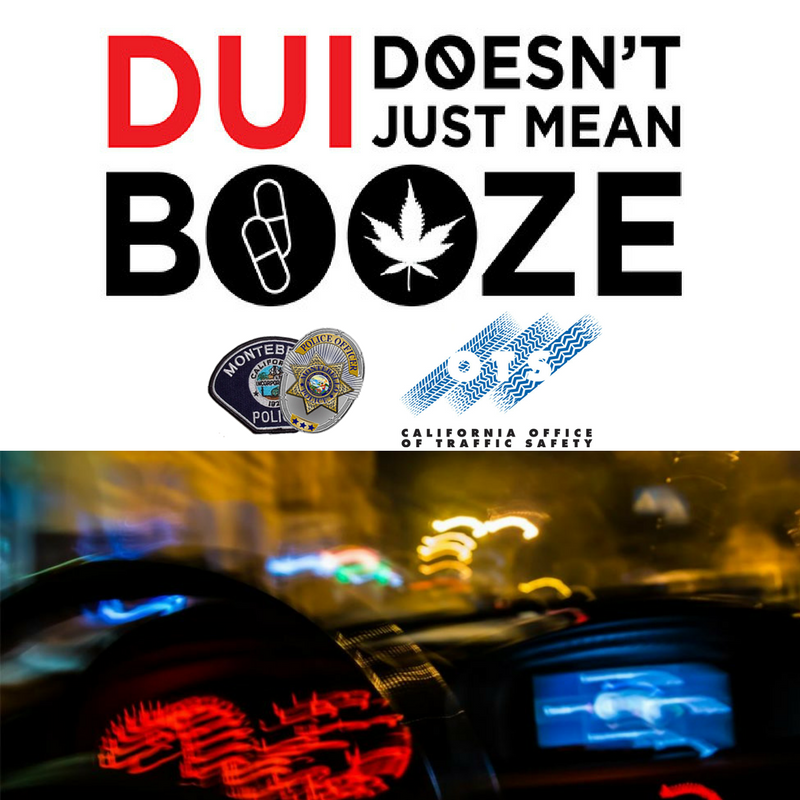 The Montebello Police Department supports the new effort from the Office of Traffic Safety (OTS) that aims to educate all drivers that “DUI Doesn’t Just Mean Booze.” If you take prescription drugs, particularly those with a driving or operating machinery warning on the label, you might be impaired enough to get a DUI. Marijuana use can also be impairing, especially in combination with alcohol or other drugs, and can result in a DUI. MMHET and CRU teaming up in the riverbed. On 04/24/18, The Montebello Mental Health Evaluation Team (MMHET) along with the Community Relations Unit conducted a “clean-up” of the riverbed area between Montebello and Pico Rivera. This area is divided between the City of Montebello, City of Pico Rivera and County of Los Angeles County. Several areas of the riverbed, especially under and around the bridges, have been used by people needing housing assistance. The primary goals of the project were to provide several sources of assistance for those in need and to remove waste and dangerous items from the area. Students will participate in informative classroom-style presentations as well as practical demonstrations with a variety of Police Department personnel. Activities include a police facility tour, a jail tour, simulated exercises, firearms instruction, fingerprinting and crime scene investigation, and other demonstrations. 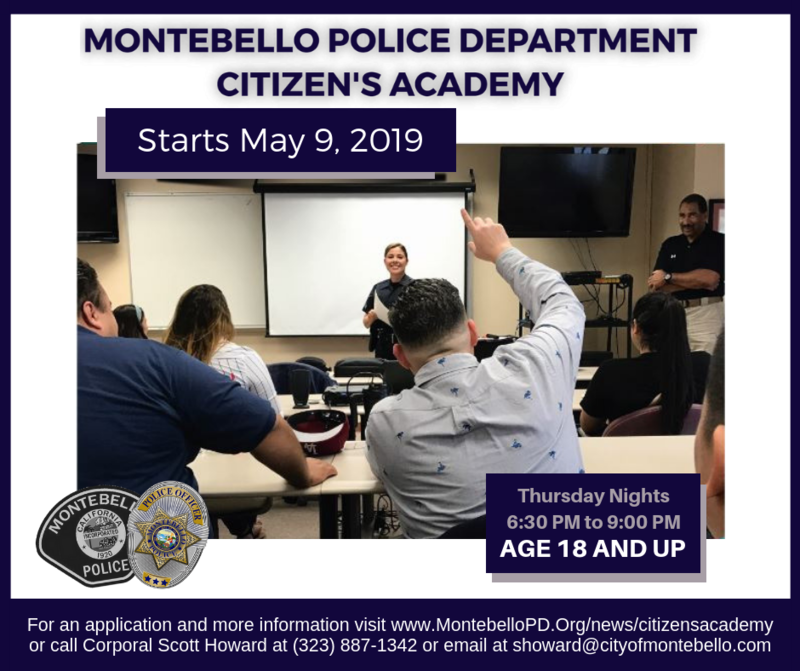 The Academy is 7 weeks long, with one two and a half-hour class each Thursday from 6:30 p.m. to 9:00 p.m. All classes are held at the police department (1600 W. Beverly Blvd).